A good number of homeowners out there tend to overlook or even neglect a simple garage door repair. What they do not realize is that doing so is a huge mistake. Apart from making sure it functions reliably, it guarantees a safe operation. Besides, the garage door serves as your property’s face. If it is in good condition, the rest of your house will definitely thrive, too. Whenever you think about your home, there are a number of things that you prioritize. One of these that you must prioritize is the garage door. When it comes to garage door service, there are various tricky things involved. Sure, it may appear like a simple task from afar. However, a garage door is a complex thing. It is made of minuscule parts, all of which are tightly designed and interwoven. In other words, it is not the idea to do the job on your own. You need to get in touch with a professional garage door repair company in Maryland. These experts can arrive within hours, especially when it is an emergency. Depending on how heavy the job is, everything will be completed in a matter of hours. Keep in mind that a garage door repair requires a good amount of experience and knowledge; hence, a professional can save you time and money. 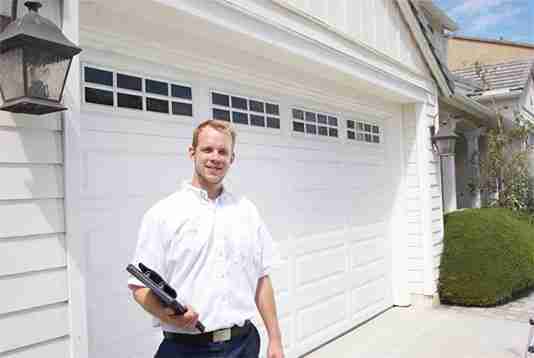 Safety – This is absolutely the number one reason why a garage door service is important. If your garage door is not working properly or it lacks proper maintenance, it can easily work incorrectly. Whether it fails or falls, you will only run the possibility of damaging your vehicles and the getting seriously injured. By properly maintaining your garage and fixing repairs, these risks can be limited hugely. Don’t Go For Costly Repair – In case you did not know, it is better to fix multiple smaller repairs on a garage door. Why? That is because it can help you prevent more costly repairs in the future. For example, you can make small repairs by having a spring replaced. You may also choose to provide proper and regular lubrication to the tracks. All of these are just some of the many small repairs you can perform in order to ensure that your door keeps running smoothly. If you choose to avoid small repairs, you will only end up replacing the entire garage door system. Moreover, the smaller repairs that you will do usually do not require an emergency repair call. But if you do, make sure that you know someone who is professional enough to perform this task. Use a Professional – As already mentioned above, there is an advantage when you do things with a professional garage door repair company. If you decide to do it yourself, you are putting yourself at risk. Whether you need a repair made to your door or just some few improvements, do not forget to call a professional. In order for the door to work accordingly, the machinery needs to be put together extremely precisely. If you do not have the knowledge or you are simply not an expert in this field, then do not make repairs on your own. Otherwise, there is every possibility for you not to acquire the repair that you are looking forward to. There is no doubt that garage doors can always be extremely dangerous. So, as much as possible, only work with professional and let him do the job. It cannot be denied that a broken garage door is considered a major disruption in your life. Whether it will not open or not close, there is no doubt it will affect your busy schedule. Our team is packed with garage door experts who understand this. That is exactly why we are happy to provide same-day service when possible. More importantly, we also encourage working directly with homeowners, as this can help in setting realistic expectations for when their project is completed. Moreover, we stay on top by providing accurate quotes, something that already includes pricing and detailed information concerning every repair. Our knowledgeable and expert garage door repair technicians in Pasadena, Maryland will make sure to educate you about the work they are trying to accomplish. Mind you, this can be done without the need for any upsells or additional fees- all of which are just completely wrong and unnecessary. We believe that producing repeat customers – most especially much-valued referrals – can be achieved through honesty and integrity. After thousands of cycles, from opening to closing, the garage door will eventually start making sounds. If the issue persists, this sound will only become louder and louder. This is quite easy to identify, though. Add to this the fact that after years of operation – and lots of maintenance neglect – dirt and debris could be trapped in the roller bearings. When this happens, the rollers will start turning inefficiently and, thus, tracks and rollers are bent. Worse-case scenario is that the door might come off completely from its mechanism. As long as you work with our certified technicians, you can get access to a readily available service up to 7 days a week. Not only do we make sure that your garage door is in perfect condition, we also make sure it can be at optimal performance.